This Volvo FH16 2012 8×4 and 10×4 is PERFECT with its own sounds, tuning parts and lots of other things. What a great truck. I drove version of this truck when I first started playing ETS2. I liked it then and I still like it now. You a lot of options for this truck. Right from engine’s to Cabin as well as lights and Drive train. What I really like was the fact that I could use MOST of the paint that I have bought plus the skin’s I have downloaded for my game. I would highly recommend this truck to any one that wants to drive it. It is just an awesome mod to drive. I has been added to my heavy haul Division in my company. Is it compatible with the one from ohaha? Sure, they are standalone trucks. Please check the download, link dosen’t work thank u.
I can download it easily. Can you show me your problem? 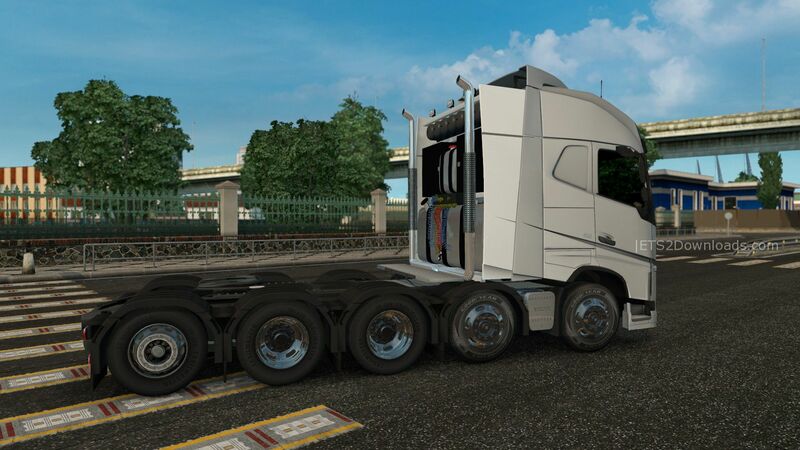 Can someone plz make this chassis for Scania r RJL? I’m also looking for it! Yeah, We have it in the new update now! This seams to be the exact mod from around 27 of July why appear again now? I like so much this mod anyway but at first i thought is something new. I’ve just tested this mod today and have found that it is still working fine so I want to let other players know. This is a nice mod and I want to bump it. Cool, i totally agree with you is a great mod and this is made after someone seen my older mod i used and can talk with roadhunter and made this with some improvements. Hope you all enjoy this mod. Does it work on 1.21? Of course yes. No problem at all! As I see there is no problem so far buddy! Well, I have. Some pieces of the lower part of the grille is missing.